Balanced by recreational and educational opportunities, Bayfield has a vibrant business community within its three distinct districts: Downtown Bayfield, Bayfield Business Center, and the Bayfield Industrial Park. Through the use of branding and a new cohesive wayfinding system, Bayfield is working to make these districts and attractions more welcoming. As a result, this will increase activity for residents and visitors in the environment encouraging new shops, restaurants, and other businesses to invest, ultimately boosting economic vitality. 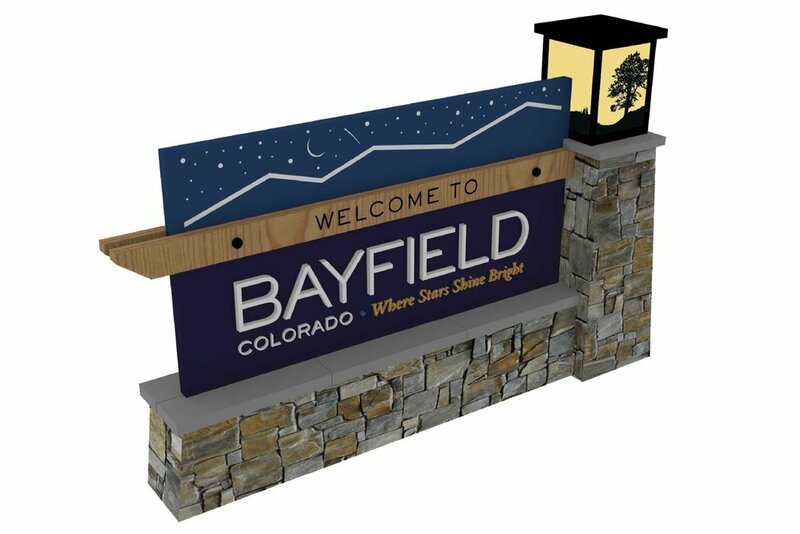 Bayfield wanted the wayfinding signage system to embrace their new brand identity and small town values while also reflecting hints of their historic past and ambition for a progressive future. Tangram developed a branded wayfinding signage system that promotes Bayfield’s newly developed brand identity and creates a sense of place. The wayfinding signage system is designed to pay homage to the town’s roots as a ranching community while allowing a modern twist that reflect’s the town’s desire to be more contemporary or forward thinking. The signage will enhance Bayfield’s urban landscape, create better vehicular and pedestrian connections, promote the town’s character, and improve the overall visitor experience. The project is still ongoing.